Remembrance Day dawned cold and windy on the campus at King’s-Edgehill School. This year the Corps was spread out over three separate areas. 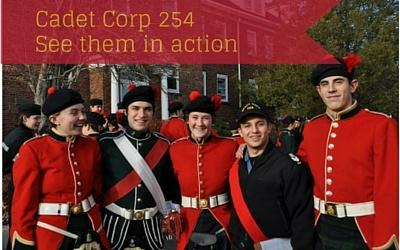 We had 19 Cadets in Ottawa as part of Operation Veteran, 6 Cadets in Hantsport under command of the Regimental Quartermaster Sergeant, Master Warrant Officer Nicholas Cheverie and 333 were on parade in Windsor. In typical Cadet fashion, the 254 thumbed its nose at the weather. 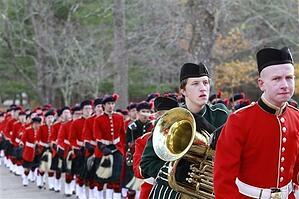 The Corps appeared in full Highland Dress ready to best the weather and pay homage to Veterans both past and present. Precisely at 1025 hours, our Regimental Sergeant Major, Chief Warrant Officer Sophie Frasergave the word of command: “CORPS – BY THE LEFT – QUICK MARCH”. The cadets formed up by company, marched through the streets of Windsor, and formed the left flank of the Hants County Legion Parade. A first this year was the formation the Corps adopted at the Cenotaph, forming in Corps in Close Column of Companies. Alpha and Bravo Company commanded by Sergeants Major Tea Racozzi and Rayannah Hwang were in the front and immediately behind them were Charlie, Delta Company commanded by Sergeants Major Calvin Shen and Duncan McLaughlin and the Corps Brass and Reed Band, commanded by the Corps Drum Major, Master Warrant Officer Joanna Bond. The Vigil Party, commanded by the Corps Drill Sergeant Major, Master Warrant Officer Lane Latreille stood steady. Sergeant Jarred Douglas, Sergeant Will Melin, Cadet Sarah Hardy and Cadet Aimee Cooper never wavered in their duty of guarding the cenotaph. Amazing! Our Corps Bugler, Warrant Officer Ella Brown was superb in her rendition of Last Post and Reveille. The Corps Pipe Major, Master Warrant Officer Nicola du Toit, moved the audience and parade members with her playing of the Lament. This year our Brass and Reed Band, under the tutelage of Mr Jeff Smith, and the command of the Corps Drum Major, Master Warrant Officer Joanna Bond played some beautiful hymns during the wreath-laying ceremony. Every year has a defining moment. This year a little lady named Claire Verryn-Stuart,accompanied by Sergeant Taylor Cole, laid the official wreath for the School and stole the hearts of the audience. Claire is the daughter of KES Teachers Jason and Cynthia Verryn-Stuart. At the tender age of two, she was composed and not in the least bit nervous. 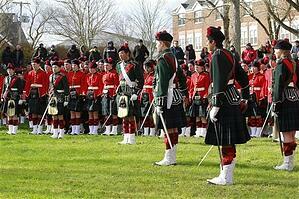 Following the parade in Windsor, the Corps marched back to Campus to observe our ceremony at the School cenotaph. Our Corps formed in Hollow Square around the cenotaph and paid proper dignity and respect to those students who had paid the ultimate sacrifice in past conflicts around the world. Gabby Shaw and Nicholas Woods were the wreath bearers for the ceremony. The wind moaned as the Headmaster read the names of the Fallen and Reverend David Curry, our Corps Chaplain gave his benediction. Following the service, the Corps moved forward to lay their poppies. There were no unhappy faces because of the cold weather, just beams of pride at the day’s accomplishment. What a great day to be in the 254.